Two color types: bright yellowish-red-brown and pale grey-yellow. Mane dark brown; stands upright with no forelock. Thin stripes on legs. Only a little known from studies in managed care. Little known about wild herd dynamics. Dominant stallion leads harem group. In managed care, hay and water requirements similar to those of domestic horses. In the wild, opportunistically feed on wild grasses and other vegetation within the limits of their habitats (constrained by agriculture). 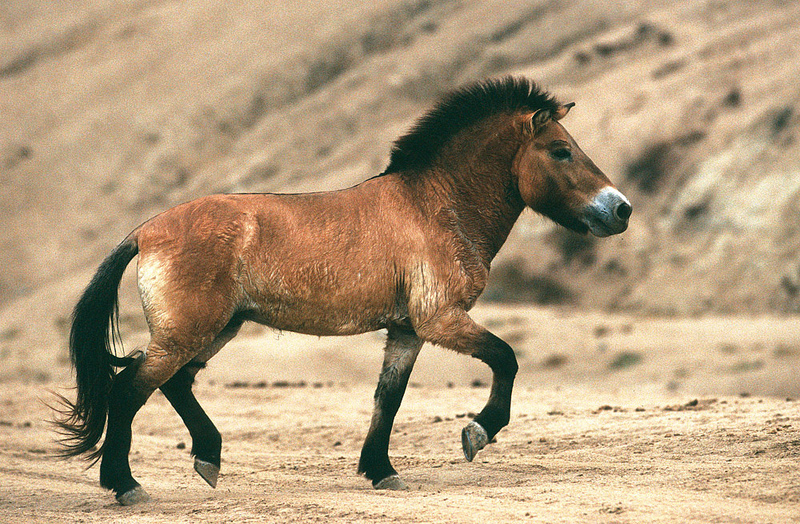 Over the years, 149 Przewalski's horses have been born at the Zoo and the San Diego Zoo Safari Park. © 2008-2017 San Diego Zoo Global. Minor updates 2012, 2013, 2017.